Sometimes things seems so obvious after they are mentioned. While that’s true in various facets of life, it especially holds true in the roster composition of a Major League Baseball team. If you think about the shortcomings of the Milwaukee Brewers over the course of the 2012 regular season, what comes to mind? Shortstop was pretty poor after Alex Gonzalez got hurt. Well, the team believes that they’ve addressed the long-term (if not the immediate) future of that position when they acquired Jean Segura. The rest of the offense was fine as a whole. The rotation needs attention now, but that’s mostly because there are specific players who won’t return in 2013, but they’ve got the bodies to fill out the rotation if pitchers and catchers reported today. No, the biggest shortcoming which hasn’t yet been sufficiently addressed is the bullpen. When 2011 ended the bullpen was thought to be a strength headed into 2012. John Axford and Francisco Rodriguez would lock down the 8th and 9th again and trading away Casey McGehee brought a capable “7th inning guy” so the Brewers thought they were covered. Well, there was a lot of failed opportunities all over and with no proven veteran options to turn to, the bullpen suffered for it. Axford seemed to find himself again by the end of the season despite the late blown Save against the Reds and he’s been endorsed (for whatever that is actually worth) as the team’s closer heading into next season. Axford’s fellow Canadian Jim Henderson will return after performing well down the stretch also. Beyond that the only name still even on the roster is left-hander Manny Parra and many fans I’ve talked to this off-season so far expect him to follow Kameron Loe and Jose Veras to the Designated For Assignment line or at least be non-tendered. The result is that in a “standard” seven-man bullpen, the Milwaukee Brewers have five spots to fill. They’ve added several players already this Hot Stove Season, but they are all marginal talents to be fair. What I was told though was that Doug Melvin and a certain player’s agent have been talking about a potential reunion, one that would right what many fans consider to be a wrong from a year ago. 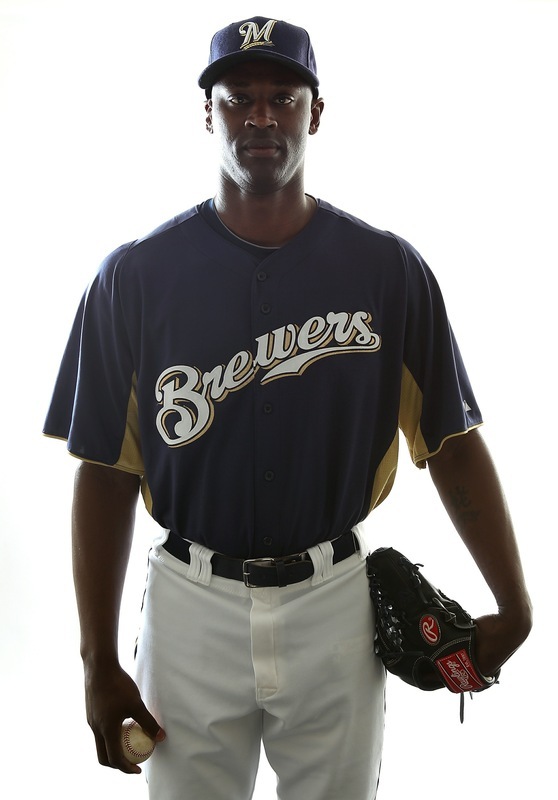 While nothing is imminent and there is reportedly at least one other team talking to this player’s agent as well, I was told that the Brewers have been in contact with the agent of veteran free agent right-hander LaTroy Hawkins. Hawk first came to the Brewers prior to the 2010 season though he lost much of that year to injury. He pitched very well in 2011 once he was ramped up into higher leverage situations. Last December he signed a contract with the The Angels Angels of Anaheim in Orange County of the State of California. He pitched well again, though not as well as in 2011. The potential downside is simply that Hawkins will be 40 next year and many players are finished by that point in there careers. Then again, many players don’t make it to 39 either. Exceptions exist for every rule. I don’t know who contacted who first and I don’t know what kind of terms have been thrown around in the early talks but you’d have to think that Hawkins would love two years but being 40 next year makes that a near impossibility. One year plus an option should be enough to get Hawkins playing a 19th year in MLB. Again, I must stress that nothing might come of this with the Brewers and nothing at all is imminent (at least not as of this morning). Hawkins is on vacation in London and obviously would have to be in the States to pass a physical for any deal. It might happen, but just not today. Still, that the Brewers might be in contact with Hawkins’ agent is encouraging. He should be able to help provide a steady, dependable option like he did two seasons ago when the Brewers made it to the National League Championship Series.